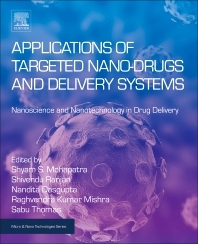 Applications of Targeted Nano-Drugs and Delivery Systems: Nanoscience and Nanotechnology in Drug Delivery explores the applications of Nano-drugs and their delivery systems, investigating the role they can play in key body systems and major diseases. The book explores how nanotechnology can be deployed in developing new drug delivery systems and how they enable pharmaceutical companies to reformulate existing drugs on the market, thereby extending the lifetime of products and enhancing performance by increasing effectiveness, safety and patient adherence, and ultimately reducing healthcare cost. Reflecting the interdisciplinary nature of the subject matter, this book includes contributions by experts from different fields. Readers will find a reference and practical source of guidance for researchers, students and scientists working in the fields of nanotechnology, materials science, and technology and biomedical science. Shyam Mohapatra is Distinguished USF Health Professor, Director of the Division of Translational Medicine at the University of South Florida. He also directs the USF Center for Research and Education in Nanobioengineering and is a Research Career Scientist at the James A. Haley VA Hospital in Tampa. He also serves as Associate Dean of Graduate Programs at the USF College of Pharmacy, and established a highly innovative Master of Science program in Pharmaceutical Nanotechnology. He has published over 170 papers and holds over 30 U.S. and international patents. He is a Fellow of the AAAAI, NAI, and AIMBE, and a 2014 inductee of the Florida Inventors Hall of Fame. 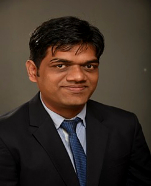 Dr. Shivendu Ranjan has extensive expertise in Micro/Nanotechnology and is currently working as Head R&D and Technology Development at E-Spin Nanotech Pvt. Ltd. He has founded and drafted the concept for the first edition of the “VIT Bio Summit” in 2012, and the same has been continued till date by the university. He has worked in CSIR-CFTRI, Mysuru, India as well as UP Drugs and Pharmaceutical Co. Ltd., India and IIFPT, Thanjavur, MoFPI, Govt of India. At IIFPT, Thanjavur, he was involved in a project funded by a leading pharmaceutical company, Dr. Reddy’s Laboratories and have successfully engineered micro-vehicles for model drug molecules. His research interests are multidisciplinary and include: Micro/Nanobiotechnology, Nano-toxicology, Environmental Nanotechnology, Nanomedicine, and Nanoemulsions. . He is the associate editor of Environmental Chemistry Letters – a Springer journal of 3.59 impact factor – and an editorial board member in Biotechnology and Biotechnological Equipment(Taylor and Francis). He is serving as executive editor of a journal in iMed Press, USA, and also serving as editorial board member and referee for reputed international peer-reviewed journals. He is the author of many books and edited six books. Dr. Nandita Dasgupta has vast working experience in Micro/Nanoscience and is currently working at LV Prasad Eye Institute, Bhubaneswar, India. She has exposure of working at university, research institutes and industries including VIT University, Vellore, Tamil Nadu, India; CSIR-Central Food Technological Research Institute, Mysore, India; and Uttar Pradesh Drugs and Pharmaceutical Co. Ltd., Lucknow, India and Indian Institute of Food Processing Technology (IIFPT), Thanjavur, Ministry of Food Processing Industries, Government of India. At IIFPT, Thanjavur, she was involved in a project funded by a leading pharmaceutical company, Dr. Reddy’s Laboratories and have successfully engineered micro-vehicles for model drug molecules. Her areas of interest include Micro/Nanomaterial fabrication and its applications in various fields – medicine, food, environment, agriculture biomedical. She is the author os many books and edited more than 6 books. She has authored many chapters and also published many scientific articles in international peer-reviewed journals. She has received the Certificate for “Outstanding Contribution” in Reviewing from Elsevier, Netherlands. She has also been nominated for advisory panel for Elsevier Inc., Netherlands. She is the associate editor of Environmental Chemistry Letters – a Springer journal of 3.59 impact factor – and also serving as editorial board member and referee for reputed international peer-reviewed journals. She has received several awards and recognitions from different national and international organizations.